Email subscribers, to see the multimedia below, you may need to click the headline to view this online. Last July I participated in a workshop on life after cancer at the National Academies of Sciences, Engineering, and Medicine in Washington. 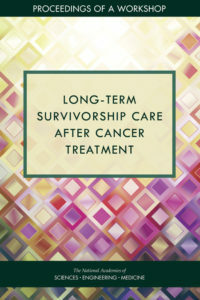 They’ve just published the final report, Long-term Survivorship Care after Cancer Treatment: Proceedings of a Workshop. It’s a free 160 page PDF. Above is a very well done two minute video in which they made a point of spotlighting the patient’s perspective. It’s well done in that it provides several distinctly different patients’ perspectives (useful for future readers of the report) and because, having been there, I can attest that this is a solid representation of what it was like to be there. The report itself [right] summarizes all the presentations and discussions from the workshop, whose home page is here. At top right on that page, under “Other Meeting Resources,” are links to videos of all the presentations and their slides. Your tax dollars at work – now that’s how science should be done! Neeraj Arora gave one of the opening overview presentation. He works for PCORI but was there largely in his capacity as a patient. This is so important, because it helps the cause when the patient perspective is presented by someone who also speaks the language of the academics. But note – just as importantly, the planners didn’t limit patient perspectives to industry insiders. Yay! Darci Graves, who had just recently joined CMS (the Medicare / Medicaid branch of HHS), spoke compellingly on Psychosocial Well-Being and Family Considerations in Cancer Survivorship. Featured on page 75 of the report is my story of shopping for skin cancer treatment in 2012, “A Patient’s Voice: The Cost of Care.” It summarizes how I researched my care options and costs, ultimately finding a procedure (for my non-high-risk skin cancer) that in the end cost me $685 rather than the initial recommended surgical procedure that would could have cost me $5,000-$7,000. Looking back on this nine months later, I have high praise for the National Academies for this event. The content was superbly chosen, and the production of these summary materials is a real contribution to the body of knowledge about this important (and often painful) issue. It was an honor to be included.